All of these condos in North Myrtle Beach face the oceanfront and have either a shared balcony or a shared patio so you may fully enjoy the oceanfront views while being at your North Myrtle Beach condominium rental. There is also a sun deck on the third floor of A Great Escape that features a picnic table so you have bring some chips and sandwiches and have a beachfront picnic with your family. Sit up there in your bathing suit and get some sun while watching the North Myrtle Beach landscape and the Atlantic Ocean’s waves. Furthermore, there is a grill on site at A Great Escape so you can make hamburgers and hot dogs during your North Myrtle Beach vacation. A cookout is a perfect way to dine with your kids when stay on the oceanfront any time of year. Perhaps you prefer seafood during your beach vacation. A collection of nearby seafood markets and an on-site grill is an invitation to make a grilled feast of shrimp and fresh grouper during your North Myrtle Beach vacation. Inside these North Myrtle Beach vacation rentals you will find a kitchenette with a refrigerator, stove/oven and microwave. You can easily make breakfast, lunch, dinner and snacks in the comfort of these condos in North Myrtle Beach, SC, which can save money and time. Run in from playing on the beach for a quick bite to eat and run right back out to the white sandy beaches. Keep your soft drinks and juices icy cold and cereal on hand for the kids’ breakfast. Make a pot of coffee and enjoy it on the oceanfront where you might even want to get up early enough to watch an oceanfront sunrise during your North Myrtle Beach vacation. These North Myrtle Beach condo rentals are kept cool in the summe*rtime by window air conditioning units. Open the doors and let fresh air blow through these North Myrtle Beach rentals when the outside temperatures are nice and inviting. All of the North Myrtle Beach condos at A Great Escape have high-speed Internet access. Bring your laptop computers and get online with friends back home, keep a digital journal of your North Myrtle Beach vacation or do a little work if it is absolutely necessary. Peruse restaurant menus before you ever leave the comfort of your North Myrtle Beach vacation rental. Check on tee times for nearby Myrtle Beach area golf courses. Having the Internet at your fingertips can prove to be quite convenient. For your additional convenience A Great Escape is a North Myrtle Beach vacation condo complex that has on-site laundry facilities. Do a load of laundry easily during your North Myrtle Beach vacation without having to leave the premises. It is details like this that help make your beach vacation a better experience. 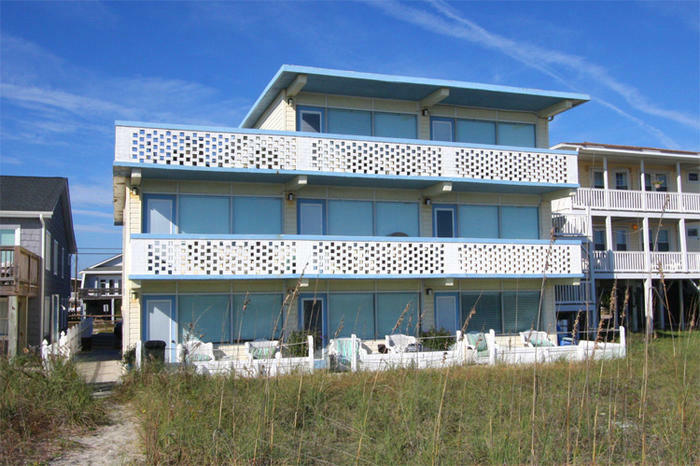 These North Myrtle Beach vacation rentals are well maintained and superbly located. Getting to such Myrtle Beach area attractions as the Myrtle Beach SkyWheel, outlet malls, seafood restaurants and amusement rides is so easy because of where A Great Escape is located on the oceanfront. Live entertainment theatres dot the North Myrtle Beach landscape and are just minutes from these North Myrtle Beach condominiums. Get tickets for Alabama Theatre. Sit front and center at The Carolina Opry and feast on a four-course dinner at Pirates Voyage. House of Blues is nearby and headlines some of your favorite musicians and bands. Check their calendar of events for the dates when you will be in North Myrtle Beach, SC and make plans to visit this concert venue that also features a restaurant. Water sports in the Myrtle Beach area include Sea Doo rentals, banana boat rides, tandem parasailing and boat cruises. Go on a deep-sea fishing charter or a head boat during your North Myrtle Beach vacation at A Great Escape. Enjoy the sand, the sea and the sun and take in all that there is to do just minutes away from these North Myrtle Beach condo rentals.